She Takes Off Her Make Up And You Won’t Believe What People Are Saying About It. The traditional standard of beauty in America has had it’s ups and downs, but one thing that remains constant is having “perfect” skin. However, a more disturbing trend has surfaced from this expectation that will chill you to the bone. The main message that cruel individuals perpetuate is that with or without make up, you’re ugly. Em Ford of My Pale Skin has stepped forward to change this double standard and stop the ridicule for people who don’t have perfect skin. The truth is that millions of adults still battle with acne and skin conditions – it isn’t always about washing your face or eating right (although this helps) it’s about being confident in yourself and not having to feel judged because of the way you were born. This film is littered with comments taken directly from social media – she received over 100,000 comments and messages telling her that she was “disgusting.” Instead of letting it drive her away from social media forever, she responded with a powerful video that will give you a new perspective on what people deal with on a daily basis. As an adult who suffers from acne, I related to this video so much that it brought me to tears. Maybe one day this perception will change, and with people like Em standing up and speaking out about it, these changes may happen sooner than we think! 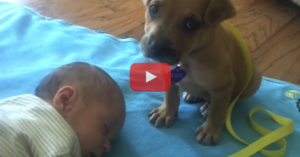 This Baby Fell Asleep…This Pit Puppy’s Reaction Is Perfect!